Phusion DNA Polymerase is supplied with standard 5X Phusion HF Buffer, as well as 5X Phusion GC Buffer, which can be used for complex or GC-rich templates. Each of these buffers contains MgCl2 (1.5 mM at the final [1X] reaction concentration). Reactions can also be optimized using the provided DMSO or MgCl2 solutions. 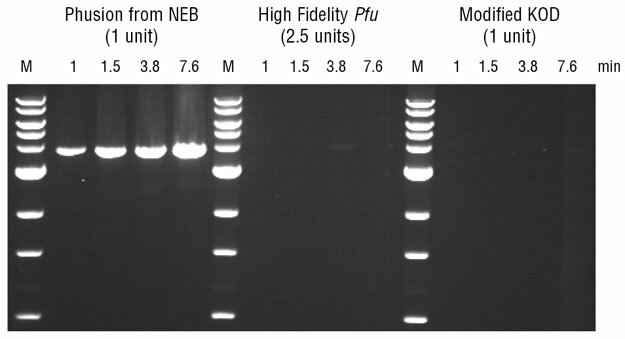 A 3.8 kb fragment was amplified from 50 ng of Jurkat gDNA using different polymerases. Reactions were carried out according to the manufacturer's recommended conditions. Extension times are indicated (in minutes). Ladder L is a 1 kb DNA Ladder (NEB# N3232). 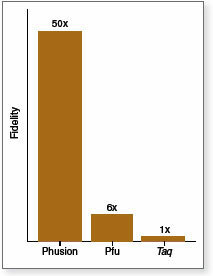 Extreme Fidelity – >50X greater than Taq. 25 mM TAPS-HCl (pH 9.3 @ 25°C), 50 mM KCl, 2 mM MgCl2, 1 mM b-mercaptoethanol, 200 µM dNTPs including [3H]-dTTP and 15 nM primed M13 DNA. What are the advantages of using Phusion® Hot Start Flex DNA Polymerase? Phusion has different annealing temperature requirements than most PCR enzymes. Please check out NEB's Tm Calculator to help you determine your optimal Phusion annealing temperature.